Providing Fishing reports for Swansboro, Emerald Isle, and the Crystal Coast! Capt's Jeff Cronk and Mike Taylor fish year round both inshore, and nearshore. They each have over 25 years professional fishing experience, over 60 Top 5 tournament wins since 2003, and 3 years filming Carolina Fishing TV. Give Jeff and Mike a call if you're interested in some serious fishing along NC's beautiful Crystal Coast! Holiday Sightfishing for Redfish! Great Day! I had another inshore sightfishing trip for Reds over this Holiday with good success. This coming Friday Dec. 30th is my last open date for Dec. Call now to reserve it! 11/18 Swansboro Clear Water Sightcasting for Redfish! Great Day! Sunday Trip- I left the dock this morning with Dave Roska and crew attempting to scour the surf for redfish. We covered miles of beach before locating a decent school of about 500 reds. We worked them for a while... having to constantly relocate them due to a dirty surf. Later, we moved into the skinny backwater flats in search of some sightcasting opportunities. Shortly into it we found some head water which turned out to be a couple hundred reds from 18in to 26in. They were spooky due to the extreme low water but, we hunkered down and waited them out. a short wait and a 6in rise in water and they began eating. We followed this school through the bay for quite a while, landing a few each time they layed down to rest on a new spot. What started out as a cold morning turned out to be very productive day hooking up with close to 20 redfish. Great work Guys! -Call for open December Dates! Weekdays and Weekends! Hello Folks! I'd like to wish all of our clients and friends a Happy Holiday Season! The past few years I've offered my clients discounted Gift Certificates to give as the perfect Christmas present to your family member that loves fishing and exploring our coast. This year I'm offering 10% off gift certificates for both fishing trips and hands on ecology tours good for the 2012 fishing season! Call or email as soon as possible and I'll get your gift certificate emailed to you the same day! These make the PERFECT Christmas Present! FISH'N4LIFE CHARTERS December Open Dates! Hello Folks, every december offers some incredible sightfishing for clear water redfish and I've got the last half of December available for some serious fishing! We've spent the last couple weeks casting to schools of 500 or more redfish and catching them until our arms were sore! Fun Stuff! We're also targeting Trout, puppydrum, Striper, and some Flounder in the Rivers. Don't sit around the house the entire Holiday Season! Give me a shout and lets go catch some fish! December 3rd Weekend Trip - Sightfishing for Redfish! 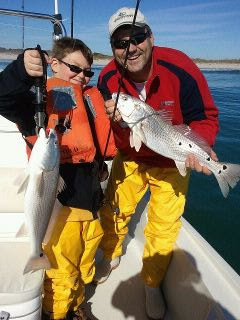 Adam and his father onboard having a great time sightfishing to a large school of redfish this past weekend. We had about 25 Redfish from 23in to 26in. We caught all of our fish on Berkley Gulp Shrimp. We stopped on the way back to the dock to play with a few trout. Great morning on the water! Great Job Guys! December Open Dates are booking fast! Here's what's still available!